The White House is unable to extricate itself from the war in Syria. President Trump is hindered both by the self-proclaimed « stable state » (according to the anonymous op ed in the New York Times), which continues to pursue the Rumsfeld-Cebrowski strategy, and by the reactivated ambitions of his Israëli, French, British and Turkish allies. The logic of these interests could displace the war instead of resolving it. The Lebanese civil war (1978-90) ended with the Taif Agreement. At the request of the Arab League, and with the approbation of the UN Security Council, the Syrian Arab Army came to the assistance of the Lebanese army in disarming the militias, then, acting as a Peace Force, stabilised the country. Thereafter, Israël accused Syria of having occupied Lebanon, which makes no sense at all. L’Effroyable Imposture, Tome 2, Thierry Meyssan, editions Alphee, 2007. This book, which is still today the best study concerning Israël’s war against Lebanon in 2006, will soon be re-published in French with a few updates. It is also available in Spanish. I do not recommend the Arab version, which is very poorly translated. Sui generis, in Latin « of its own kind », impossible to compare with anything else. According to an eye-witness, this is how we should understand the declaration of French Minister for Foreign Affairs, Laurent Fabius, at the « Friends of Syria » conference in Marrakech – « Al-Nusra is doing a good job » (in other words, our Al-Qaïda mercenaries are providing France and the Gulf Cooperation Council with the service for which we are paying them). Read the Foreign Office e-mails revealed, in 2005, by Derek Pasquill. https://www.lewrockwell.com/2018/09/thierry-meyssan/finding-a-way-out-of-the-war-against-syria/ “Stability, America’s Ennemy”, Ralph Peters, Parameters, Winter 2001-02, pp. 5-20. 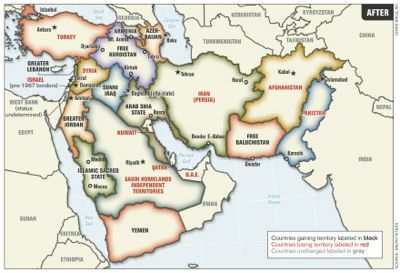 « Blood borders : How a better Middle East would look », Ralph Peters, Armed Forces Journal, June 2006.